Abt Sportline is a pretty capable and successful tuner that specializes in Audi products that has dropped out of public view recently. 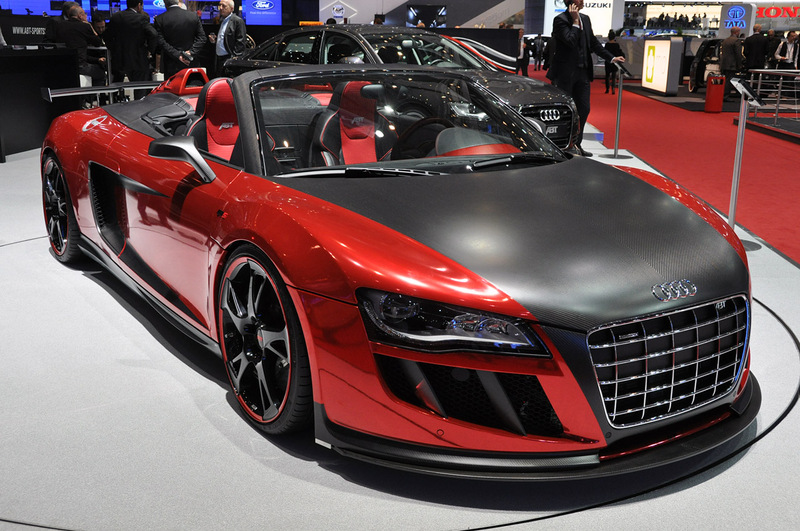 In hoping to get back in the game they came to the 2011 Geneva Motor Show with a tuned version of the Ingolstadt’s flagship Audi R8 V10 Spyder. Called the ABT R8 GTS, the German mid engined supercar gained a considerable performance upgrade which takes it up to 620 horsepower. 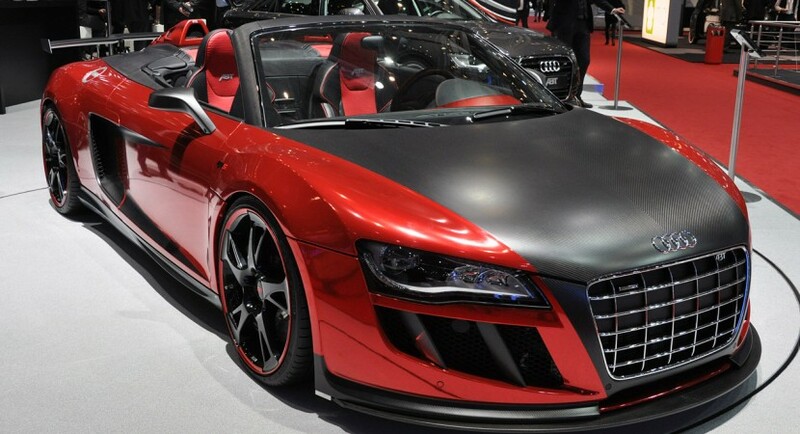 Losing out some weight will also help the performance Audi R8 V10 Spyder and therefore the ABT Sportline version gets carbon fiber and carbon fiber-reinforced plastic all around. While the technology used by the German tuner is significantly impressive, it’s no where near as likeable as the new look. The Abt Sportline Audi R8 V10 Spyder seems to mix racing aero and a street looking image while still looking completely stylish. It’s a rare combination to get. Also, the 19 or 20 inch custom ABT wheels painted the same two tone red and black finish do help with the looks. I’m not sure the Abt Sportline brand is now saved but their version of the Audi R8 V10 Spyder is definitely an impressive looking machine. that, the S8, like the RS4, has been exceptionally well rcveieed in North America and the rest of the world. If memory serves me correctly, Audi NA sold out its allocation for 2007 several months ago, so I don’t think there is much concern on the vehicle not selling here.The failure of the Phaeton in North America was quite distinct from Audi’s (success) with the A8 platform here. Audi has and continues to improve its standing in North America and has been able to sell the A8 and new S8 with little trouble. Volkswagen was attempting to launch itself into a product range approximately $30,000 and a whole caliber of client higher than they had ever done before. They lacked the advertising, the dealership support and service and the brand cachet to succeed in this. It was not the fault of the product, but the brand itself that failed to live up to the product, which in essence is a Bentley Continental for about $75,000 less.Audi, on the other hand, has a premium moniker and reputation that continues to improve year upon year. They already have the service and support structure in place to cater to that clientele. This is one reason why the A8 has succeeded where the Phaeton failed. Audi’s premium reputation is far greater in the rest of the world than it is in North America, this is true. However, hop into the way back machine with me about 30 years and you’d find BMW in a similar position. As you should well know, building a brand takes a long time and Audi is doing that very well at the moment.Back to the S8 specifically: I would suggest you try driving one before taking a shot from the peanut gallery. If you need more proof, please check the March 2007 issue of Automobile Magazine, which ranked the S8 well above the comprable Mercedes AMG and Masarati.The S8 is not designed as a volume product, it is a specialty model for the elite for those drivers who know about and respect the engineering and development work of the product. For those drivers who recognize a great product when it is crafted. And it will sell, in limited numbers as it was planned, to those people, just as the RS4, S6 and R8.Were the S8 to be a volume product I would agree with you on your critique that it would not succeed, but it is a niche product. Having said that, your criticism of the brand is a hackneyed response based upon old perceptions of Audi. Ten years ago I would have agreed wholeheartedly, but I would recommend taking a look around today. You’ll find the landscape significantly changed. I dream driving these car. from 2008 i was in love about it. In my life only i´ve seen 2 in the road, for about 5 seconds, its speed was 220km/hr aprox. It was incredible!! !